We love ours too! That�s why we built the UFO202 � a simple, affordable way to get your records and vinyl tapes into the digital realm. 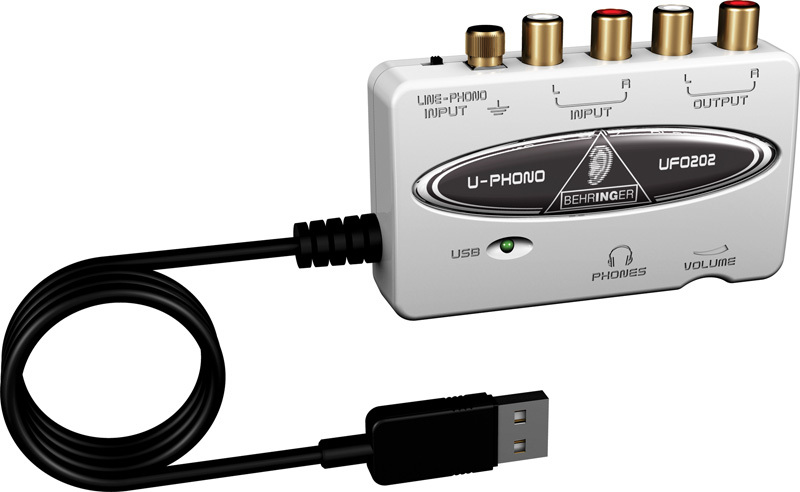 The UFO202 is easy to use and comes with a bevy of professional software that not only converts your favorite recordings into files on your computer, but also removes those annoying scratches and pops so common to vinyl media. 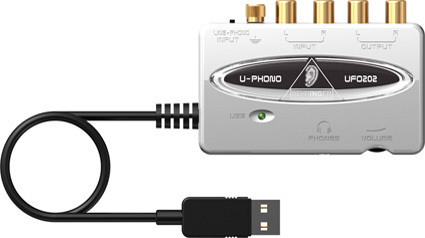 State of- the-art, switchable Line/Phono preamps and digital converters ensure the utmost in sound quality, making the U-PHONO UFO202 Audio Interface a must-have for every audiophile. 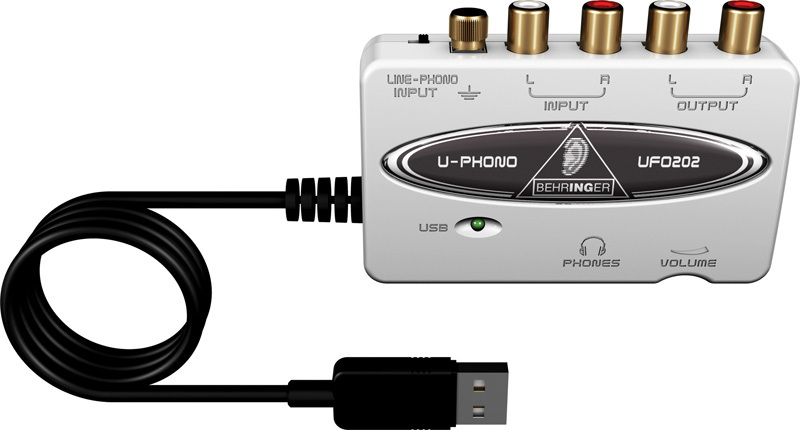 This ultra-compact, USB-powered device lets you connect your PC or Mac computer to virtually any piece of audio gear. It gets its power from your computer�s USB bus, so no external power supply or batteries are required. 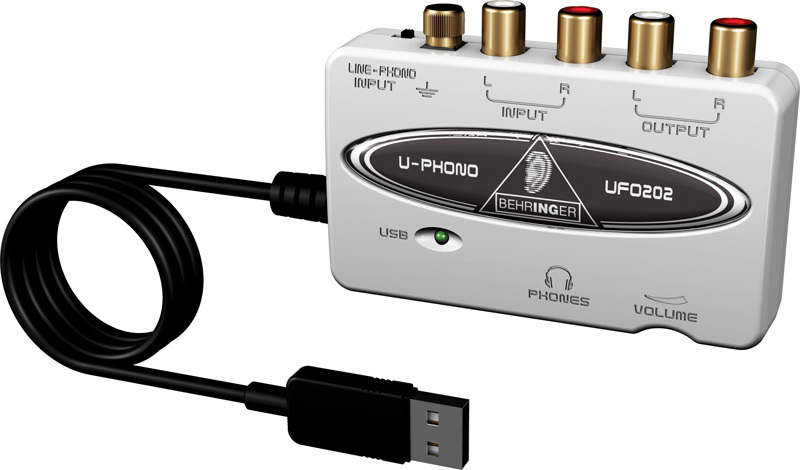 And the UFO202 requires no special setup or drivers�just plug it in to a free USB port and start recording. Powerful Recording Interface When used as a professional interface between a mixing console and your computer, myriad options become available. 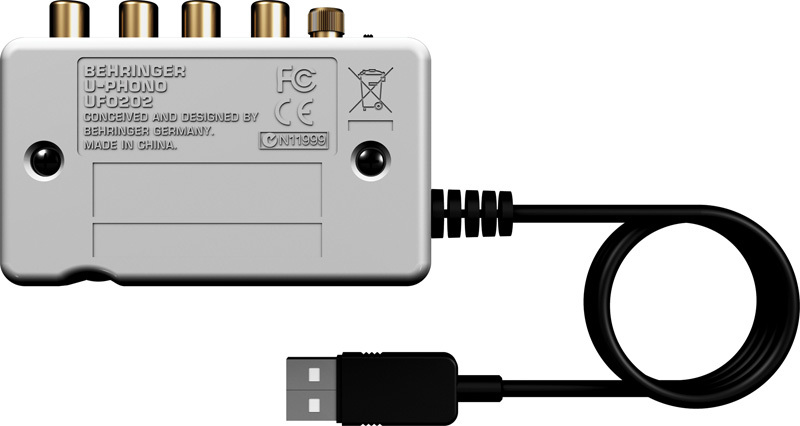 Some of these might include connecting the UFO202�s RCA outputs to the TAPE INPUT jacks of your mixer or active monitors, or directly into the input channels of the mixer. Connecting to mixer input channels gives you access to equalization and allows the use of the AUX Send features of your mixer to build extremely versatile monitor mixes for your recording sessions. Because you�ll want to take full advantage of the UFO202�s podcasting and recording potential we�ve included a massive software package including Audacity, Podifier, Juice, Podnova and Golden Ear. You�re ready to go live on your Mac or PC computer right out of the box! You also get more than 150 virtual instruments and effects plug-ins, turning your computer into a complete home-based or mobile recording studio from input to output. When you�re ready to take your recording projects to the next level, XT Software�s energyXT is just the trick. This amazing DAW (digital audio workstation) makes it easy to manipulate your audio and MIDI files, turning song ideas into stunning CD or web-ready recordings. energyXT includes its own multi-FX processor, built-in synthesizers and a drum machine, both of which can be accessed directly via an external controller (such as our UMA25S or UMX25) or programmed in step-write mode.